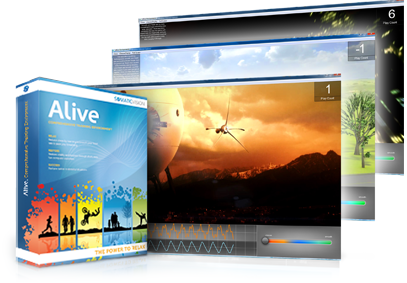 Alive is the foundation platform that includes the Somatic Vision Games. Alive gives you an array of engaging software games designed to help you build mental performance and the ability to better manage daily stress while having fun. Improved performance in school, sports and at work. The ability to stay relaxed and balanced in challenging situations. The ability to enter a relaxation state whenever you want. Kids who need to better regulate themselves: They build these skills while playing fun video games. Which version of Alive is for me? Diagnostics, educational resources, progress tracking, and a virtual coach to teach you techniques for breathing to lower and smooth heart rate, how to interpret your body data, and to suggest a program for meeting your goals. Alive is not just about computers! Your Alive User Guide includes the multi-disciplinary Alive & Beyond 8-Week Program. The Alive & Beyond 8-Week Program has been developed to help you get the most out of Alive, bringing in off-screen concepts and exercises to complement the Alive software. For those using Alive with a child or teen, we include a section on Alive for Younger Users. You may want to follow Alive & Beyond exactly or you may want to tailor it to your needs. Either approach is fine and will help you in your journey toward stress relief and peak performance. Alive is the brainchild of Ryan Deluz, a software engineer with a background in biology. Ryan's vision to bring a liveliness and ease-of-use to innovative and powerful self-regulating tools — and his passion for his work — are at the core of Alive. Alive & Beyond — and much of the Alive software itself — was developed in partnership with Yuval Oded, a cognitive behavioral psychologist and leading expert in biofeedback. Yuval, a consultant to the French Ministry of Defense, is a Clinical Psychologist who has developed biofeedback programs to help military personnel keep a clear head, suppress unhelpful responses to difficult situations, and manage an array of decisions and tasks. In his clinics, Yuval treats a wide array of conditions, including anxiety disorders, behavioral disorders, chronic illnesses, neurological problems, psychosomatic problems, head trauma and post traumatic stress disorder. For use with all Somatic Vision games and tools. Captures your heart rate variations and sends them to the Alive interactive interface. 80% of us suffer from stress. Each year, we get busier and busier. We do more in a day than ever before, absorbing the stress of navigating a world that is socially and technologically complicated. It is important to develop techniques to reduce the impact of stress so we can enjoy life more and reach our goals. What are the Advanges of the School Version?